If you haven't read our new page on An explanation of Chrysler's part and casting number system, be sure to check it out also. Blocks are one of the most misunderstood aspects of building a big block Mopar engine. Never has there been more misinformation, propaganda and rumors floating around. In the many years we have been involved with the big block Mopar engine, we have seen and owned many many hundreds of used core engines. We have used this opportunity to try and keep records as much as possible as to different advantages and disadvantages that various blocks offer. All the facts listed below are the result of our independently testing, measuring, sonic checking or otherwise gathering information directly from original sources: either the blocks themselves or the original factory drawings (blueprints) that Chrysler used to manufacture the blocks. This eliminates all chance of secondhand information, rumors, marketing or sales talk, etc. Hopefully this page will help hobbyists, restoration experts, and racers decide which choice of block is best for them. For many years it was thought that late model blocks were thin wall and should not be bored more than .030 over. 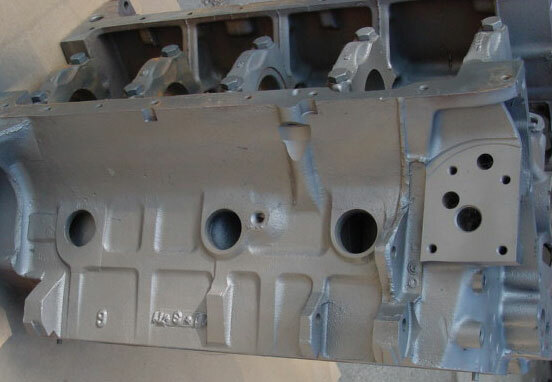 Then, in the May '98 issue of Mopar Performance News, in an article titled "The Big Block Story" on page 16, it states: "The newer production 440 blocks, '73-4 to '78 are thinwall cast, so you can only bore them .020"..."
So, as you can see, even these multiple sources of info which come straight from Chrysler engineering contain different information. What is the Mopar enthusiast supposed to think? Are the thinwall blocks from 76-78, or are they from 73-78? Can you bore them .030, or is .020 the maximum? We will answer all these questions once and for all based on scientific fact. The purpose of citing these books and articles is not to make Chrysler/Mopar Performance look bad. As racers and hobbyists, we are grateful for the resources and aftermarket parts that Chrysler makes available. However, it does demonstrate how even someone who does their research could be easily confused. So, it is to the benefit of everyone involved to help spread information which is known to be true, even if goes against popular thinking. So what is the truth? Get ready for this. There is no such thing as thinwall blocks. They DO NOT exist. We have sonic checked over 50 blocks, and have found absolutely no evidence that later model blocks have cylinder walls that are any thinner then earlier blocks. In fact, we have found later blocks to have less core shift, meaning the cylinder walls are of a more uniform thickness all the way around. This makes perfect sense, considering that B engines were in production for over 2 decades. 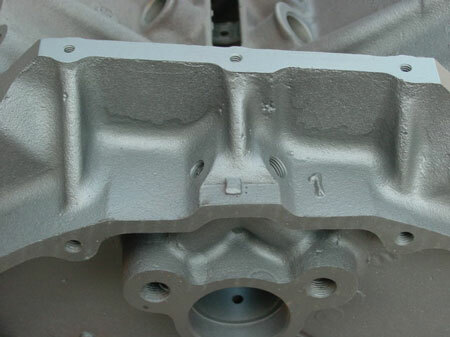 During this time, it would be expected that there would be small improvements in the technology of casting processes, quality control, etc, which would help create a better product. In case you still doubt our findings, check out this article from Mopar Action magazine: http://www.arengineering.com/articles/sonicbig02 In it, they sonic check 20 blocks and come up with the same findings we did. They also explain how statistically 20 blocks is enough of a sample to estimate the rest of the 440 blocks out there. We've tested over 50 with the same results. This article also has some great info regarding hardness of the iron used, in which they find that the earlier blocks do have slightly harder cast iron, by about 10%. 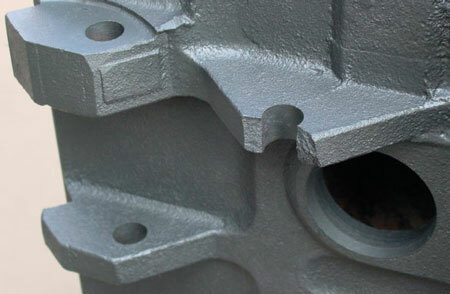 Another issue is block weight, or the quantity of cast iron which is actually used in the block. Like the Mopar Action article, we have weighed many blocks and have found later blocks to weigh more, or have more cast iron in them. Since the reasoning behind thin wall blocks is that the factory used this practice in the late 70's to save money on iron (which is a known fact with SB Chevy engines), the fact that later blocks weigh more shows that Chrysler had no intention of using less iron to save money. Which is great news for us racers and performance enthusiasts. So, the bottom line? Save and use those late model blocks. And go .060" over with 'em all day long. Also on that note, we know of several machine shops that have been going .060" with late model blocks for over 20 years with no problems. There are SIGNIFICANT differences between blocks in the main bearing saddles and support webbing. Lets start with "RB" raised deck blocks. SOME 440's cast in '76 and later have CONSIDERABLY thicker main saddle supports. The only block we have found to have these supports are the 4006630-440 casting #, which was used from late 75 until the end of production in 1979. In case you have heard that 440's were discontinued in 1978, this was for cars only. 440's continued to be offered in trucks and motorhomes all through 1979, and we have had many 440 blocks stamped with the 1979 model year on them. Shown above is a picture of a 4006630-440 (1978 model) 440 block. The "A" measurement typically is about 3.190". This is about 60% thicker than the early 440 blocks shown above. "B" typically measures about .520", which is still about 40% thicker. The blocks with these thicker supports were not cast during any specific date period. There is no external markings or numbers which show they are different from the other blocks. They DO seem to be more commonly used for truck motors, however just because you have a truck 440 does not mean it will automatically have the thicker main supports. One important fact is that while 4006630-440 casting # blocks are the only blocks we have found to have these thicker supports, not all these blocks will have them. There appears to be no other way to tell if a block has them or not other then actually looking at the supports themselves. Without the crank and rods removed from the block, it is very hard to tell. Now on to low deck "B" blocks. Shown above is a #2 main saddle off of a 1970 model 383. We have found all 71 and earlier low deck "B" blocks (including 361's, etc) to have this type of main saddles. "A" in this case measures between 1.900 and 2 inches, and "B" measures about .350" These are probably the smallest measurements of all the big blocks. Now lets compare this to the 400 blocks below. Shown above is a 3614230 (1972-73) 400 block. These are the thickest of any blocks around, bar none. we didn't even bother to mark the "A" dimension because it is so huge it is practically off the map, and the "B" dimension came in at a whopping 1.350! When you compare this to the 383 and 440 pictures above it makes them look like a joke. One important side note however, is that there are some 3614230 blocks that DO NOT have the thick main supports. Before you spend hundreds of dollars to ship that block across the country, make sure it has the thick mains!! Be sure to always measure or at least see a clear picture. Moving on, if you can't seem to find the superblock above, a good second choice is shown above; a 1973 400 block, casting #3698630. Notice the main saddle supports are CONSIDERABLY thicker then both the 383 AND the pre-76 440 shown above. "A" in this case measures 3.750" and "B" measures .575! This is close to a quarter inch more metal in the area surrounding the bearing shell, and the support leading up to the cylinder is almost twice as wide! We have found the thickness of "B" to vary slightly, even among blocks with the same casting # cast during the same month of the same year. In this case we have found blocks between .525 and .575, but still worlds above the .350-.375 measurements listed above for 383's and 440's. Combine this with the fact that the cylinders are shorter (since the block deck height is shorter) compared to an RB, and you can see that a 400 block is ABSOLUTELY stronger then any other block made. 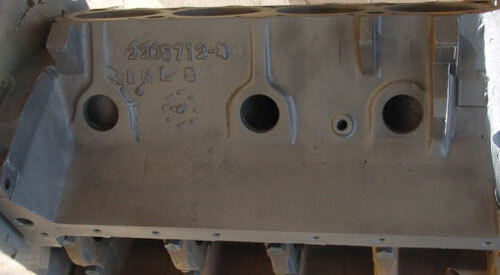 Shown above is the #2 saddle on a late model (76-78) 400 block, casting #4006530-400. The "B" measurement remains the same as the early 400 block at about .525 -.575, while the "A" goes down to roughly 3.300, making the support only less than half an inch narrower then the early 400 (still almost 90% of the width), and still over 1 1/4 inches wider then 383's and early 440's. The end result? Pretty ironic. Chrysler famed powerplants that dominated the muscle car era, 383's and 440's have the weakest supports of all, while their "smog" motors, 400's and late model 440's, which couldn't get out of their own way, have blocks that are considerably more reinforced and able to handle much higher power levels. There is absolutely no physical difference between a block with an HP or HP2 stamp and one without. 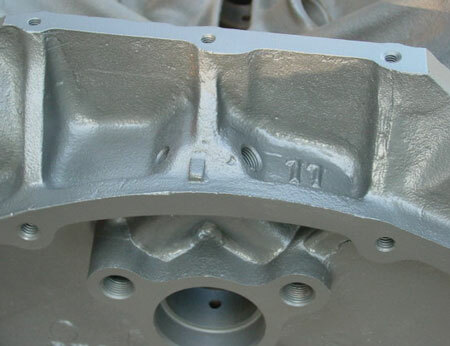 All blocks were cast and machined at the foundry, and then assembled at Chrysler's 2.1 million square foot "Trenton" assembly plant in Trenton, Michigan. 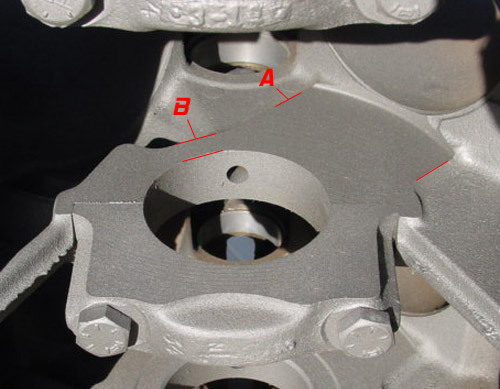 During assembly, if the engine was given high performance cam and valve springs, or in some cases other items that differed between HP and non-HP engines such as: six pack rods, carbs, etc., then the engines ID pad would be stamped with HP. 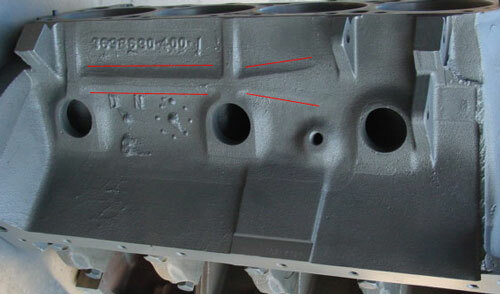 All blocks originally came from the same place, and there is absolutely no difference in cylinder wall thickness, nickel content in the cast iron, strengthening ribs on side of the block by the freeze plugs (see below for the real story on this,) or any of the other myths you have heard. 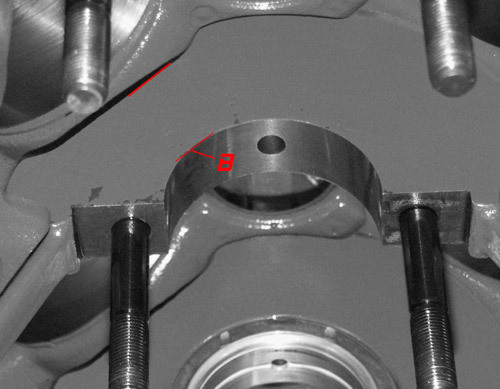 The number 2, which you may find after the HP, (or in the case of non HP blocks, you may find just a "2" by itself, usually in the lower right hand corner of the ID pad) refers to the shift during which the engine was assembled. In running a factory, one 24 hour day can be divided into three 8 hour shifts. The first shift was considered a "1" however to save time, Chrysler did not stamp a "1", they just left it blank. So an HP2 engine, only means that the engine happened to be assembled on the second shift. There is no advantage to an HP2 block over an HP. we have never seen an HP3, (or just a "3") although Chrysler does allow for it in their documentation, so let me know if you have one or have seen one. Also of note is that non-HP engines usually used the same heads, intake manifold, and many other parts, which is great since it makes it a lot easier to bring a non-HP engine up to the power levels of a factory HP and beyond. But unless you are doing an original restoration, don't worry about finding and/or paying extra for an HP block. The strengthening "rib" or support can be found on all 440 blocks starting approximately with the 1969 model year, and ALL 400 blocks. On the side of the block just above the freeze plugs, sometimes you will find a strengthening support or "rib" cast into the block. This was started in the 1969 model year on 440's (E 440 code on the ID pad), or approx mid '68 casting date. This is an improvement that was instituted around this time and lasted until the end of production. Every 400 block we have seen has this support, and NO 383 blocks we have seen have it, (Another small reason to build that 400 stroker...) Yes, blocks do occasionally crack around the freeze plug area, so it is considered desirable to find one that has this strengthening rib, however it is not a necessity, and certainly no reason not to use a nice 66-68 440 block you may find or have. As mentioned above, this rib has nothing to do with HP or non-HP. Notice also there is a slightly raised area in the center of the block, starting at the oil pan rail and leading up the skirt to the freeze plug area. The machined part of this (by the oil pan rail) was used to stamp the engines serial numbers. When an engine has the strengthening rib, it will usually have this pad as well. This explains why serial numbers were first used in this location in 1969. The only exception we have found is 70-71 383's... they will have the pad without the rib. Shown above for comparison is an early block without the rib or pad. One other addendum.. Some 413/426/440 blocks commonly known as "industrial / cold weather or heavy duty truck" blocks have another pattern all together, with even more reinforcements. Shown below is one of these. The thickness of the mounting lugs or "ears" was increased starting in 1975. 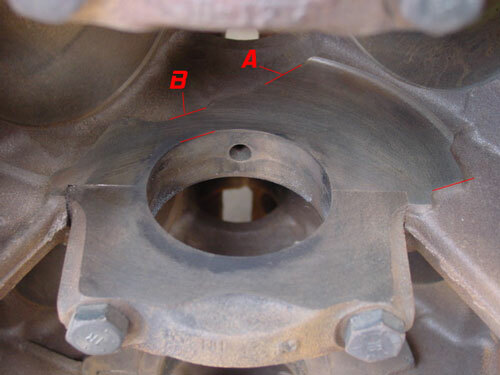 One fairly common problem that big blocks are plagued with is breaking off of the somewhat fragile "ears" or "lugs" on the side of the block that the motor mount support brackets bolt to. The engineers at Chrysler must have realized this, because starting in the 1975 model year (along with some other changes listed below) the thickness of these lugs was increased by about .200". This was done with both 400's and 440's. Early (pre 75) block mounting ears on the left. Later (76-79) block mounting ears on the right. The difference is obvious. We rarely see the later blocks with cracked ears. Yet another reason to use late model blocks. The cooling passages in the deck surface were changed. 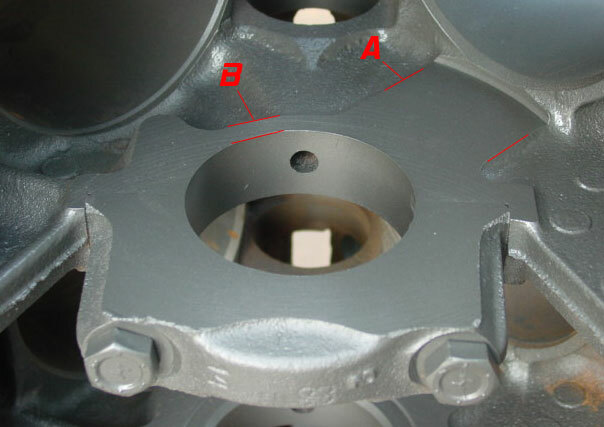 This earlier style deck surface shown below with 3 smaller, perfectly round coolant holes between the cylinders (circled in red) was used throughout most of the 60's and early 70's. The later style deck surface uses larger ports for added cooling. (see below.) In the new "Big Block B/RB Engines book from Mopar Perfomance, part # P4876825, (pg. 58) these are referred to as "'figure eight' shaped cooling holes." These enlarged passages came into use first in low deck "B" engines in the early 70's, being phased in on some 383's as early as the 1970 model year. By the time 400's were released in 1972, nearly all were using this later type of deck. In 440's it was first used in 1975 and continued until the end of production in '79. Some people like the added benefit of extra cooling, while others think the additional iron missing weakens the deck. Blocks don't commonly crack in this area, so to us the additional cooling seems like a good benefit. The bellhousing design was changed slightly. Like many of the changes listed above, this applies to ALL 400's, and 440's starting in '75 and continuing until the end of production. 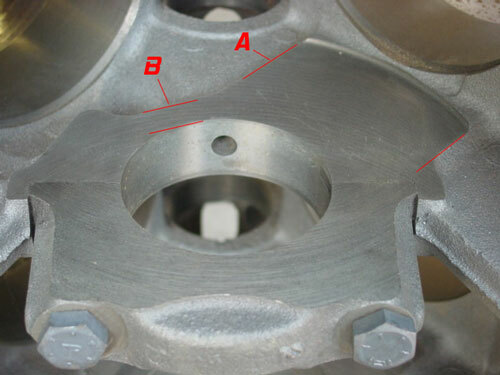 The design of the bellhousing was changed slightly, mostly in the top center, near where the oil sending unit screws in. The bolt pattern remained the same, and both early and late styles are completely interchangeable with transmissions, etc. however the appearance is slightly different, so it may be something to think about if you are going for an accurate restoration. 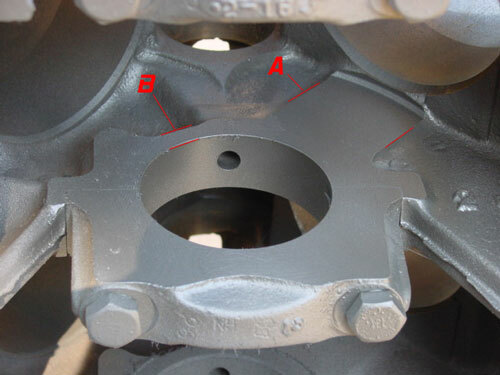 Shown above is an early style bellhousing, vs. late style shown below.